Rave On Buddy Holly is a compilation album by various artists released on June 28, 2011, through Fantasy Records/Concord Music Group and Hear Music. A tribute album to musician Buddy Holly, who died in a plane crash in 1959 at age 22, the title refers to the song "Rave On", one of his biggest hits. Contributing artists included Paul McCartney, who owned Holly's publishing catalog at the time of the album's release, and Graham Nash, a former member of The Hollies, who were named in commemoration of Holly. Critical reception of the compilation album was positive overall; many reviewers appreciated the album in its entirety but criticized select performances. Rave On Buddy Holly reached a peak position of number 15 on the Billboard 200 and also charted on the Top Canadian Albums, Top Digital Albums and Top Rock Albums charts. "Dearest", performed by The Black Keys, received a nomination for Best Pop Duo/Group Performance at the 54th Grammy Awards (2012). The album opens with The Black Keys' "Dearest", just over two minutes in length. Cee Lo Green's vocals on "(You're So Square) Baby I Don't Care" last just ninety-three seconds; the song has a total length of just over one minute and thirty seconds. Overall, critical reception of the album was positive, though many reviewers criticized select tracks. Allmusic's Stephen Thomas Erlewine complimented the artists involved for not settling for "mere replications" of Holly's song, for playing "fast and loose", and for "radically reinterpreting the original" recordings. However, Erlewine described Karen Elson's cover of "Crying, Waiting, Hoping" as "overly ornate" and categorized Lou Reed's "Peggy Sue" as "turgid grind". David Fricke of Rolling Stone criticized McCartney's "It's So Easy" and Nash's "Raining in My Heart", describing the latter as a "deft balance of folk-rock sparkle and overcast-afternoon sigh". Fricke appreciated contributions by Nick Lowe, Justin Townes Earle, and especially Patti Smith's "Words of Love", which he claimed was delivered as a "precious wish" just as Holly had written. BBC Music contributor Mischa Pearlman complimented performances by Smith, Lou Reed, Cee Lo Green, and Julian Casablancas, as well as Kid Rock's "soulful" cover and Modest Mouse's "hushed reimagining" of "That'll Be the Day". Pearlman also criticized McCartney's performance, writing that he "trie[d] a little too hard", and was disappointed by Fiona Apple and Jon Brion's cover for sounding "almost a carbon copy" of the original. She summarized the album as a "wonderful testament to [Holly's] songwriting prowess, longevity and legacy". Paste magazine's Jeff Gonick positive review highlighted The Black Keys' "beautifully minimalist" cover, Casablancas' "rich and rocky" title track, My Morning Jacket's "beautifully crafted croon", as well as Modest Mouse's performance. Marc Hogan of Spin magazine gave Rave On Buddy Holly an eight rating on a ten-point scale and described Green's performance as "so good it'll give you hiccups". The Washington Post's Allison Stewart preferred artists whose performances were more similar to the original, including Apple, Elson and Earle; she criticized Modest Mouse and McCartney, whose covers differed greatly from the original, though she complimented Kid Rock's "Detroit soul rave-up" despite its differences. NPR contributor Stephen Thompson wrote a positive review of the album, claiming that the featured musicians "prove to be a nice fit for Holly's timeless words and tunes" and "give this collection the sweetness its source material demands, without losing sight of the melancholy that lies beneath." One reviewer for The Salt Lake Tribune expressed similar sentiment, describing the album as a "fitting, often avant-garde and unusually fun tip of the hat to one of the best penners of melodies ever", specifically highlighting contributions by Green and McCartney. Rave On Buddy Holly peaked at number 15 on the Billboard 200. The album also reached number twenty-one on the Top Canadian Albums chart, number thirteen on the Top Digital Albums chart, and number two on the Top Rock Albums chart. "Dearest", performed by The Black Keys, received a nomination for Best Pop Duo/Group Performance at the 54th Grammy Awards (2012). 1 2 3 4 5 Erlewine, Stephen Thomas. "Rave on Buddy Holly". Allmusic. Retrieved June 30, 2011. ↑ Spicer, Nathan (April 28, 2011). "Buddy Holly Tribute Album to Feature My Morning Jacket, The Black Keys, Paul McCartney and More". Paste. Paste Media Group. ISSN 1540-3106. Retrieved June 7, 2011. ↑ MacNeil, Jason (April 28, 2011). "Buddy Holly Tribute to Feature Paul McCartney, Lou Reed and Cee Lo Green". Spinner. Retrieved June 7, 2011. 1 2 3 4 5 Thompson, Stephen (June 21, 2011). 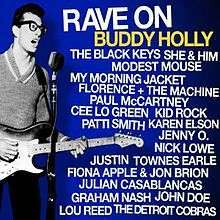 "First Listen: 'Rave On Buddy Holly': Hear Covers By Paul McCartney, Fiona Apple, The Black Keys, Cee Lo And More". NPR. Retrieved June 30, 2011. ↑ Kerns, William (March 14, 2009). "Holly's influence will not fade away". Lubbock Avalanche-Journal. Lubbock, Texas: Morris Communications. Retrieved July 13, 2011. 1 2 Pearlman, Mischa (June 30, 2011). "BBC Review: Rave On Buddy Holly: A wonderful testament to Holly's songwriting prowess, longevity and legacy". BBC Music. Retrieved July 13, 2011. ↑ Tucker, Ken (June 22, 2011). "Music Review: Rave On Buddy Holly (2011)". Entertainment Weekly. Time Inc. ISSN 1049-0434. Retrieved July 13, 2011. Note: Originally published in issue #1161 on July 1, 2011. ↑ Powell, Mike. "Various Artists: Rave On: A Tribute to Buddy Holly". Retrieved 9 October 2011. 1 2 Gonick, Jeff (July 1, 2011). "Various Artists: Rave On Buddy Holly". Paste. Wolfgang's Vault. ISSN 1540-3106. Retrieved July 13, 2011. 1 2 Fricke, David (June 28, 2011). "Music Reviews: Various Artists: Rave On Buddy Holly". Rolling Stone. Jann Wenner. Retrieved July 13, 2011. 1 2 "PopTop review: Buddy Holly tribute album raves on". The Salt Lake Tribune. Salt Lake City, Utah: MediaNews Group. July 11, 2011. ISSN 0746-3502. Retrieved July 13, 2011. 1 2 Hogan, Marc. "Various Artists: 'Rave on Buddy Holly': They don't sound much like him and that's okay". Spin. Spin Media LLC. ISSN 0886-3032. ↑ Stewart, Allison (July 1, 2011). "Album review: "Rave on Buddy Holly"". The Washington Post. Washington, D.C.: The Washington Post Company. ISSN 0190-8286. Retrieved July 13, 2011. ↑ "Rave on Buddy Holly: Charts & Awards". Allmusic. Retrieved July 24, 2011. ↑ "Nominees and Winners". The Recording Academy. Retrieved February 22, 2012. ↑ "Rave on Buddy Holly". Allmusic. Retrieved June 30, 2011.